E. The code compiles ﬁne, so C is incorrect. 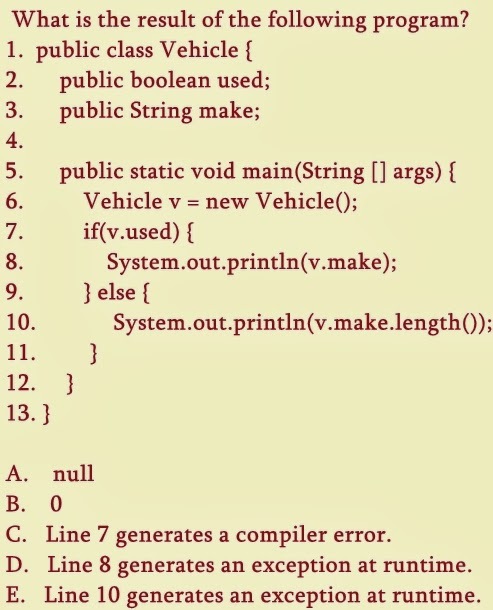 The used ﬁeld initializes to false and the make ﬁeld initializes to null for the new Vehicle v. Therefore, line 7 is false and line 10 executes. Because v.make is a null reference, attempting to invoke its length method results in a NullPointerException at runtime. Therefore, the answer is E.
HOW MANY TYPES OF NETWORKS?